Eddie Glaude, professor of religion and African American studies at Princeton, and author of the recent In a Shade of Blue: Pragmatism and the Politics of Black America was interviewed recently on the Fox News program Hannity and Colmes. In the interview Glaude takes on the conservative half of the Hannity and Colmes duo to debate religion, blackness, and the church in the context of Obama and the recent Jeremiah Wright controversy. Also read an excerpt from Glaude’s book. . . .
German intellectual Thomas Mann left behind not only the legacy of his extraordinary literary career, but six children who—though often overshadowed by their father’s fame—became literary and artistic figures in their own right. 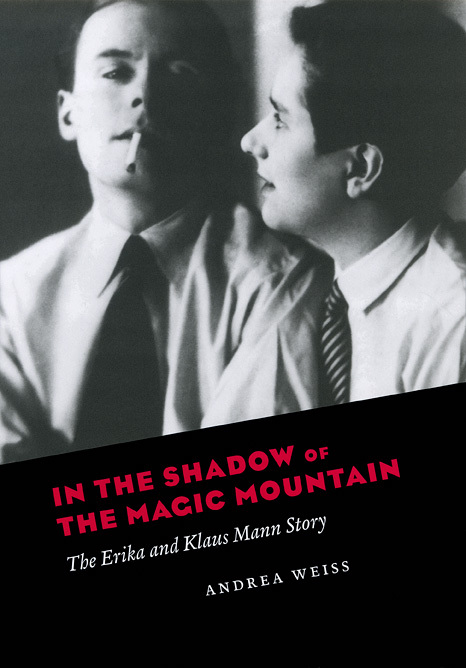 In her new book In the Shadow of the Magic Mountain: The Erika and Klaus Mann Story Andrea Weiss delivers a dual biography of Mann’s two eldest, Erika and Clause, whose literary, political, and artistic exploits she recounts in vivid detail. In a review running in the April edition of Harper’s, John Leonard notes that in delivering its candid portrait of the Mann children’s dramatic lives, the book also provides a revealing look inside the elite literary and artistic circles which the Mann children traversed. Leonard writes: The years of exile, war, and America are an extravagance of highbrow gossip, with such raisins in the cake as André Gide, Bertolt Brecht, Sybille Bedford, Jean Cocteau, Stefan Zweig, Muriel Rukeyser, Christopher Isherwood, Janet Flanner, James Baldwin, and Carson McCullers. Erika wrote magazine articles and children’s books; Klaus wrote novels, plays, and film scripts; and the two of them collaborated on travel books, all while the FBI and the INS were hot on their trail for “premature anti-Fascism.” Pick . . .
Yesterday’s New York Times ran an interesting op-ed piece by author and sociologist Monica Prasad on recent proposals to impose a tax on industrial emissions of carbon dioxide in an effort to combat global warming and other negative impacts of greenhouse gasses. In the article Prasad—author of the 2005 book The Politics of Free Markets: The Rise of Neoliberal Economic Policies in Britain, France, Germany, and the United States—uses her superior knowledge of European economic policy to demonstrate how one European country has made the carbon tax work. Prasad writes: The very thought of new tax revenue has a way of changing the priorities of the most hard-headed politicians—even Genghis Khan learned to be peaceful, the story goes, when he saw how much more rewarding it was to tax peasants than to kill them. But if we want lower emissions, the goal of a carbon tax is to prompt producers to change their behavior, not to allow them to continue polluting while handing over cash to the government. How do you get them to change? First, you prevent policy makers from turning the tax into a cash cow. Carbon tax discussions always seem to devolve into gleeful suggestions for ways . 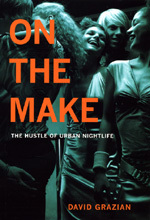 . .
An interesting piece on David Grazian’s new book On the Make: The Hustle of Urban Nightlife is running as the cover story in the current edition of the independent Philadelphia weekly City Paper. A.D. Amorosi’s article begins by comparing Grazian’s sociological study of Philly’s nightlife to Damon Grunyon’s scabrous tales of prohibition era New York: When David Grazian started working on his most recent book, he wanted to find the skin and bones of Philly’s latest nightlife renaissance. Now that it’s finished, On the Make: The Hustle of Urban Nightlife paints the scene like something out of a Damon Runyon novel, full of schemers and suckers born every minute. Flirty waitresses, winking hostesses and grinning bouncers make appearances in On the Make. So do PR consultants, drinking wing men, snobby DJs, event planners and paid partiers—the mod equivalent of Runyon’s bookies and mooches. (No one in On the Make is named “Nathan Detroit” or “Sky Masterson,” but a name like “Nicole Cashman” does the trick.) You can’t help but expect a chorus of “Luck Be a Lady” to come swinging through the text. Both entertaining and illuminating On the Make offers a riveting look at the various gambles, hustles, and . . . According to the New York Times, yesterday evening marked a significant checkpoint in the War in Iraq when a roadside bomb exploded killing four more U.S. troops, bringing the total American death toll in Iraq to 4000. With no end in sight and casualties steadily rising, media outlets around the globe have used the 4,000th death as an opportunity to look back on the war and the many soldiers who have lost their lives there since 2003. 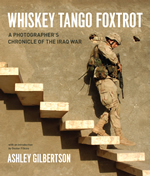 But providing perhaps one of the most vivid and personal of these retrospectives, is NYT photojournalist and author Ashley Gilbertson’s recent Whiskey Tango Foxtrot: A Photographer’s Chronicle of the Iraq War. Documenting the conflict from the initial invasion, to Iraq’s first national elections, Gilbertson’s book tells candidly of his own experience photographing the war and of the lives of the soldiers fighting it. To preview some of the images from the book navigate to the author’s portfolio on the NYT website. To hear more about the Gilbertson’s experience in Iraq, you can navigate to the Press’s special website for the book which features and exclusive half-hour interview with the author, or see this archived video from CSPAN’s Book TV of Gilbertson’s talk earlier . . . The Chicago Tribune recently ran an article on Steven Simoncic’s new play, Heat Wave—a “drama detailing Chicago’s 1995 summer meltdown that killed more than 700 people.” Based on Eric Klinenberg’s book of the same name, the play remains true to its source by detailing, more than just a natural disaster but “the social fault lines that the heat wave revealed.” The Tribune‘s Louis R. Carlozo writes: As the 100-degree days piled up, so did the corpses. Emergency rooms overcrowded to the breaking point; public officials bickered over whether heat or chronic health ailments caused the deaths. Yet as the heat broiled, no one disputed that temperatures inside many upper-floor apartments reached 125 degrees or more. While city denizens from Lincoln Park to Hyde Park cranked their air conditioners, or else cleared out of town during ComEd’s power outages, many with disabilities and the poorest of the poor had no place to go, no one to turn to. They suffered, and succumbed, in silence.… Quoting Simoncic the article continues: “As I read Eric’s book and ruminated on my drafts—which I did for two and a half years—I started to get protective of the victims. And I became off for them. . . .
Podularity.com, a literary blog based in the UK, is running an interesting podcast of an interview with author Martin Kemp on the topic of his recent book The Human Animal in Western Art and Science. 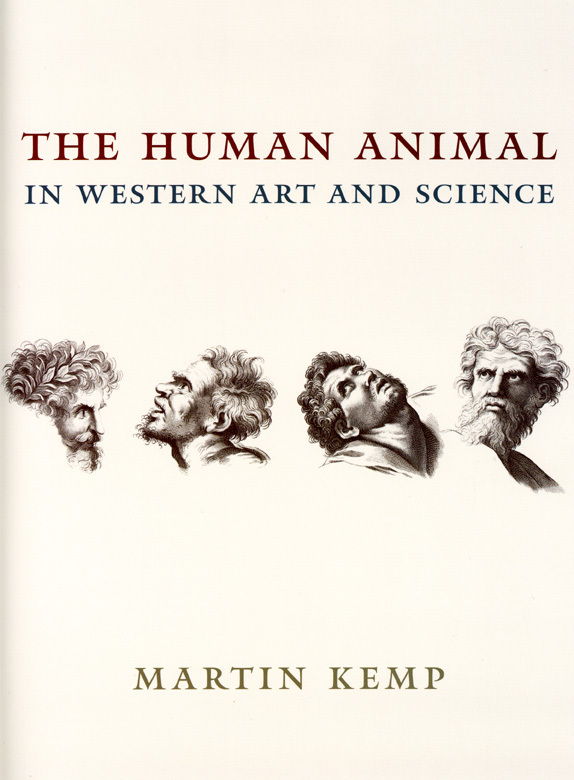 Interviewer George Miller engages Kemp in a discussion of the links between humans and animals embedded in Western culture to explore the question; where is the line between animal and human? And, does the line even exist at all? Navigate to Podularity.com to listen. . . .
After hearing a case about the District of Columbia’s handgun ban on Tuesday, the Supreme Court has the opportunity to redefine the legal interpretation of the Second Amendment. As laws controlling handgun ownership have been enacted, such laws have been challenged on constitutional grounds. Control advocates interpret the amendment as creating a collective right—the right of states to form militias and of individuals to participate in the common defense. Control opponents interpret the amendment as creating an individual right to own and use firearms. 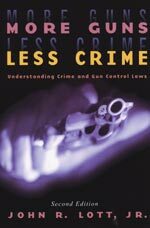 John R. Lott Jr., author of the influential and hotly-debated book More Guns, Less Crime, weighs in on the side of the latter interpretation in a commentary in the National Review. You can read the article at the National Review Online. Also read an interview with the author. . . . 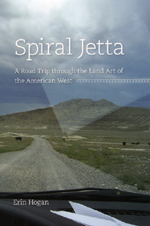 The April/May issue of Bookforum is running an early review of Erin Hogan’s unconventional new travelogue, Spiral Jetta: A Road Trip through the Land Art of the American West. (The book will release in mid-April.) Noting the author’s willingness to trek off the beaten path to experience first-hand the unique blending of landscape and sculpture in American land art reviewer Nico Israel writes: Earth art, that consummately American movement that sprang up during the high-Vietnam War era, combined a steely-eyed commitment to the truth of materials and to the power of basic geometric forms with a desire to get off the grid or at the very least “expand the field” of sculpture. Sometimes called environmental or land art, or Earthworks, depending on its practitioner, it demanded of its actual, physical viewers—”fit, though few,” as John Milton might have said—a pilgrim’s willingness to go on the road to remote places in order to see the works and experience the landscapes that they reframed and illuminated.… Enter self-described “recovering art historian” Erin Hogan, whose book Spiral Jetta records her retrospective responses to a highway journey in her Volkswagen, in which, over the course of about three weeks, she visited Spiral Jetty, Michael . 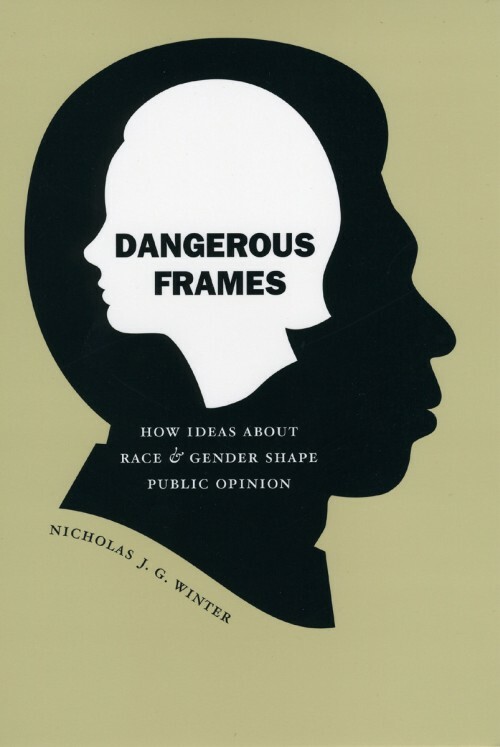 . .
Nicholas J. G. Winter is publishing his book, Dangerous Frames: How Ideas about Race and Gender Shape Public Opinion at the perfect time, just as these issues are getting their most concrete expression in the political sphere. We asked him to reflect on the the Democratic presidential race in light of the ideas he explores in his book. The historic presence in the Democratic primary race of both the first woman and the first African American with serious shots at a major party nomination has understandably brought lots of media attention to the roles of gender and race in Americans’ political thinking and voting. Much of this coverage obscures rather than clarifies those roles. On the one hand, commentators ask whether black and female voters support “one of their own.” Do black voters support Obama? Do women support Clinton? On the other hand, others ask some version of the question “Are Americans more racist or more sexist?” Is gender more fundamental to American social structure, or is racism more centrally embedded in American politics. More concretely, will white male swing voters be more disinclined to vote for a woman or an African American man in the general election? . . .